In reading An Edible History of Humanity , I came across a chapter about Chairmen Mao's Great Leap Forward and his mimic of the ill-fated Stalin creation of Collective Farms. In their efforts to boost exports and increase industrialization, both leaders ended up starving millions and hiding their faults from the world. In doing some research on the topic, I came across this site: MaoPost.com. 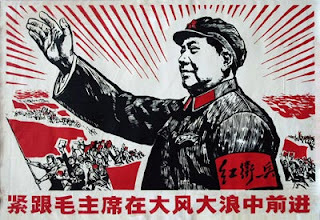 Not only does this site have thousands of Chinese propaganda posters that you can share with your students and purchase, but it has something else I've never seen before. MaoPost.com gives you the ability to have yourself painted into a Chinese Propaganda poster. It's a pretty cool idea, but it does coast a few hundred dollars. So if you've ever dreamed of being a Communist Revolutionary... here's your chance. Great suggestion elektratig... thanks for reading.